The band that make the uke cool was formed in 1985 as a bit of fun, but the first gig was an instant sell-out, and they've been performing ever since, with sold-out concerts across the world, including Great Britain, Germany, Sweden, Finland, Poland, France, America, Canada, New Zealand and Japan. 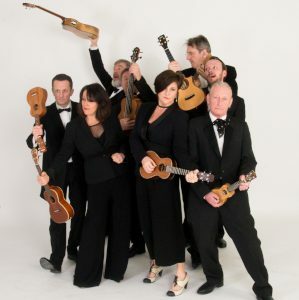 Spawning countless imitators, The Ukulele Orchestra’s music has been used in films, plays and TV ads, while their collaborators have included Madness, David Arnold, The BFI, Ministry of Sound, The Kaiser Chiefs and Yusuf Islam (aka Cat Stevens). All-singing all-strumming, their legendary live shows see them plunder all genres of music, from Wagner to Nirvana, Bach to Bowie, with wit and sheer plucking brilliance.